who settled in Sierra Madre, and tell their stories. To arrange a tour of our museums (read about them in our Museums page on this website), or to arrange to have historical characters visit your classroom, please go to the Board page of this site to find the contact information for the Education Chair. We look forward to hearing from you! 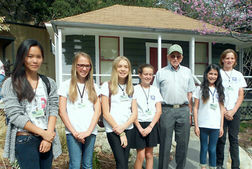 Teens interested in local history are invited to join the Sierra Madre Public Library, Teen History Docent program. Volunteers are trained and then guide visitors on 20-minute, family-friendly tours through the past with photos of Sierra Madre’s history using digital storyboards. 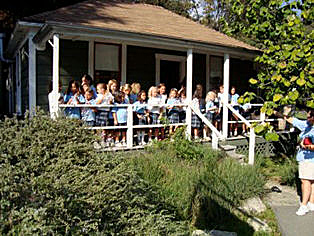 Tours take place in the Library’s Local History Room and the Richardson House museum. 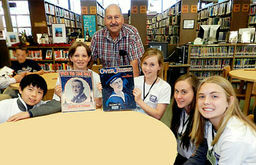 The program is open to teens, 12 years old through seniors in high school, who are interested in local history, public speaking, and earning community service hours. Training and tours are after school and on Saturdays. “Through this program, we have been better able to share the City’s rich history with more people, created a wonderful partnership between the Library and the Historical Preservation Society, and expanded the Library teen volunteer program,” said Library Director Carolyn Thomas. This program was made possible by a grant of $7,500 from the California State Library in 2013 and by additional funding from the State and the Sierra Madre Historical Preservation Society. or stop by the Library to pick up a form.